Dr. Chen is dedicated to his patients, parents, staff and community. He enjoys sharing his knowledge and, experience with the children and parents enabling them to learn the importance of oral health. He believes prevention is better than cure. Throughout the years, Dr. Chen has grown to love his profession even more. Just knowing the appreciation the parents and patients have, makes his profession so fulﬁlling and satisfying, He ensures everyone that walks through the door is treated like family. This “wicked” cool pediatric dentist, is of Chinese Jamaican heritage. He was born in Toronto, Canada and was raised in St. Andrew, Jamaica. He earned his Bachelor of Arts degree from the University of Florida and continued studies at Nova Southeastern University College of Dental Medicine, where he was awarded his degree as a Doctor of dental Medicine. Realizing the joy and need for treating children, he spent an additional two years to complete his specialty training in Pediatric Dentistry at NSU as well as the Hospital component at Miami Children’s Hospital and Joe DiMaggio Children’s Hospital. 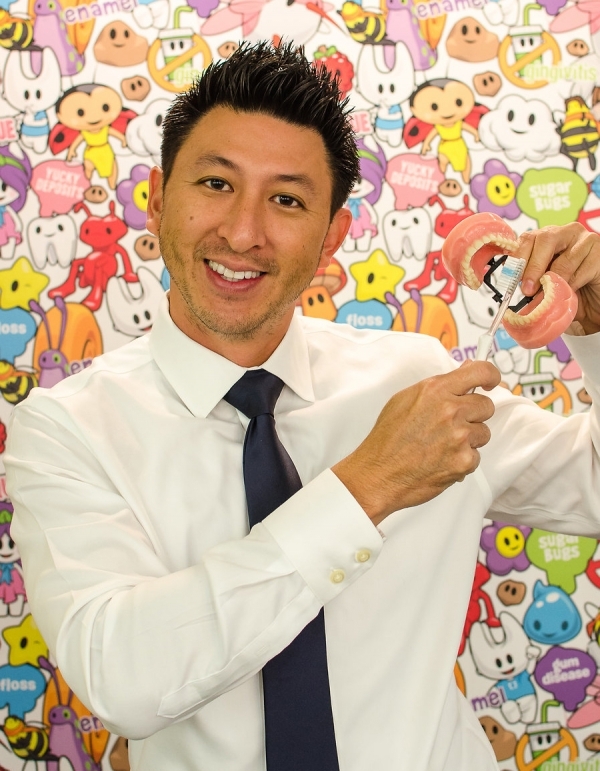 In just 5 years of Tooth Tales being open, Dr. Chen’s dream of expanding the office came true. To top it off, after many special request he even opened a general dental practice (The Bite Dental) for our parents and adults in the community. Dr. Chen team’s up with multiple organizations to help treat those in need of dental treatment. He’s been apart of the Give Kids a Smile Organization and the NSU Medical Mission, where he treats underprivileged kids throughout the rural areas of Jamaica. He’s made it his life’s work to help those around him and has done the same in our community, inspiring his team and those around him. If you didn’t already know, family is everything to Dr. Chen. His absolute favorite thing to do is spend time with his wife Melissa, “The most beautiful girl in the world” and his two adorably sweet and funny daughters Elektra & Luna. Aside from his passion to create smiles, He likes to stay pretty active participating in 5k runs, playing sports like golf, soccer & basketball and doing his best to stay ﬁt and healthy!